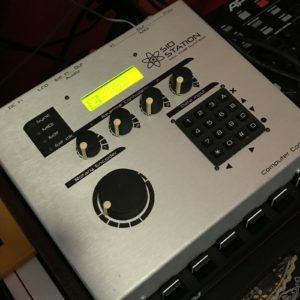 “This synthesizer is fast becoming a collectors item as it was Elektron’s first product, and SID chips are almost impossible to find these days. Sounds are crisp and aggressive, and really cut through the mix. I’ve used this thing on house as well as hip hop and it has shined on all the tracks it’s been used on. Please note that this SID suffers from a known sidstation issue (according to gearslutz) and crashes occasionally after a few hours of continuous use due to voltage spikes causing the RAM to freak out. This bug is non-destructive, just means you need to save your patches to a midi sysex dump often to ensure you don’t lose anything, reset the RAM (in the menus) and reupload your patches. I’m getting rid of this synth because I came across 8 SID chips and am going to try to build one of the big a$% mb-6582’s. Includes original manual! *non-original wall wart (have an aftermarket one that works fine).